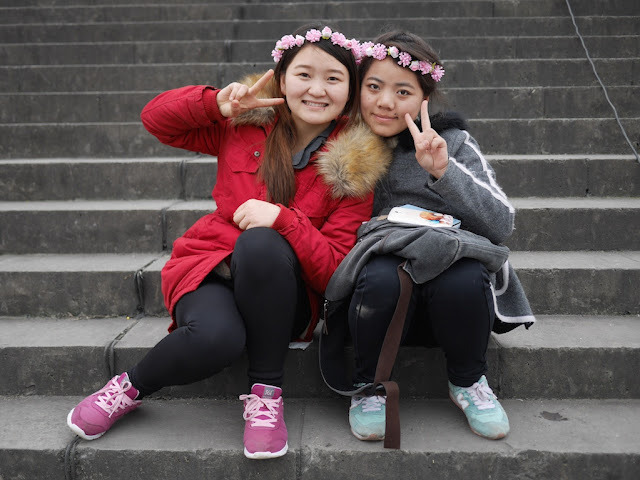 Later, I will share a more complete photo of the object of photographic interest behind the two posing girls and say more about it. I saw two of these cabinets, one partially open, along hallways to restrooms. No signs displayed messages forbidding anyone from borrowing a helmet or a shield, both helpfully labeled with "riot control" in Chinese. I refrained from parading through the mall with riot control gear though. I wondered what types of riots they think could occur someday. 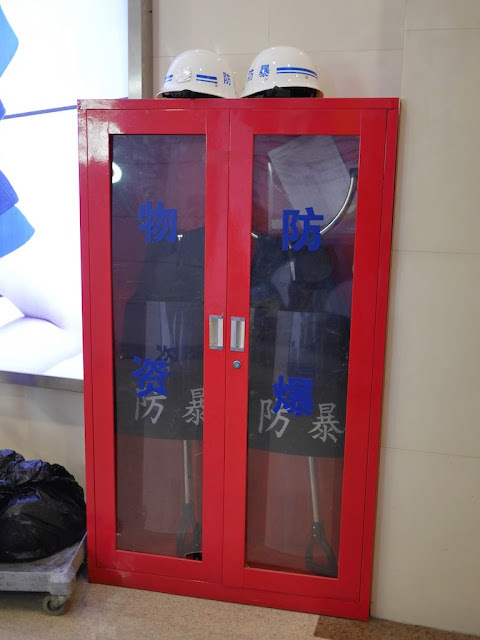 I don't remember seeing something like this before in a mall, including the Changsha Kaifu Wanda Plaza. Perhaps other malls store their riot control supplies more discreetly, or I have not happened to notice them. 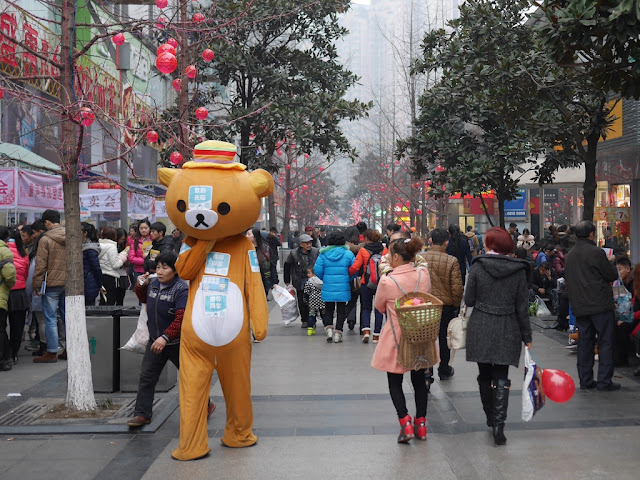 Anyway, I can report I have seen many shoppers but no signs of riots inside the mall during my recent visits. At least now I know where I can get a helmet if one springs up. 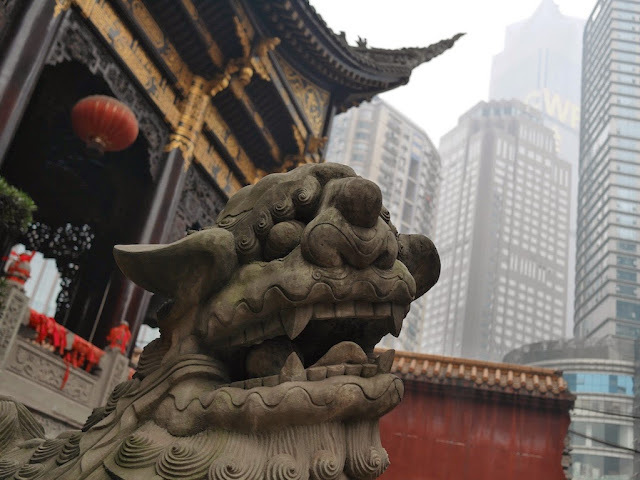 As the competition for a domestic e-commerce platform is fierce, Chongqing plans to expand the competition worldwide, creating multinational e-commerce industries in the city and building 10 industrial parks. 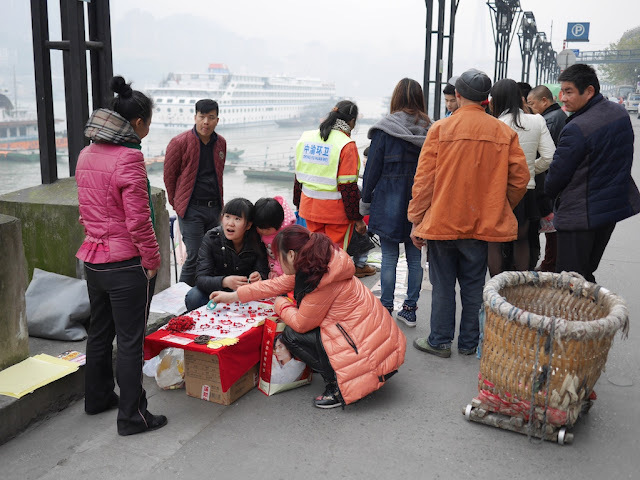 In 2014, Chongqing will support 500 to 800 middle and small-sized enterprises to perform e-commerce. 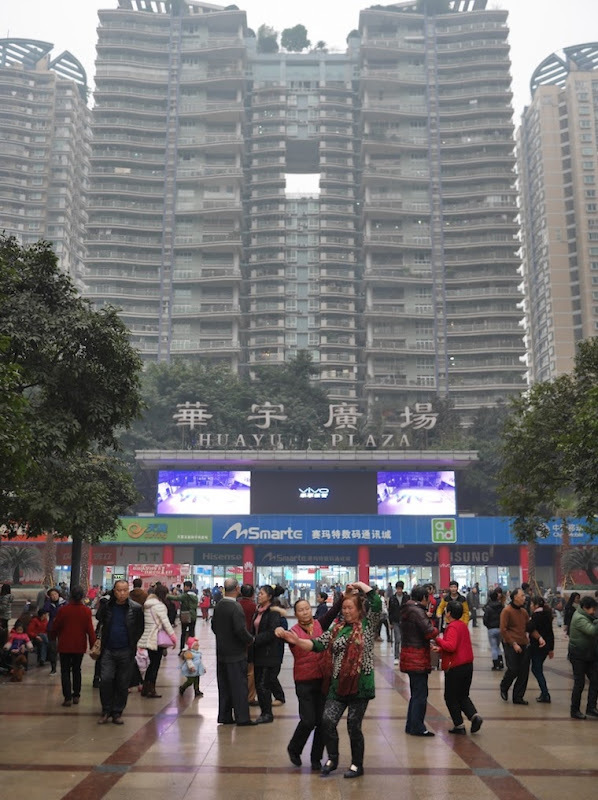 Chongqing has decided to create multinational e-commerce industries throughout the city and build 10 industrial parks. 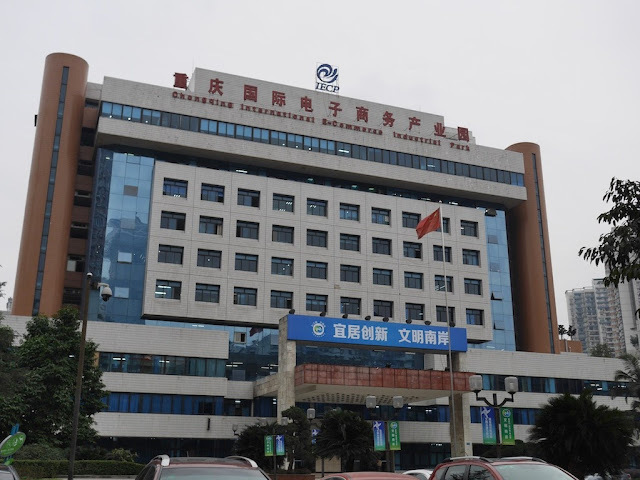 Chongqing International E-commerce Industrial Park, built in Nan’an District in 2013, is Chongqing’s first e-commerce industrial park involved in multinational trade and has introduced enterprises like basic operation, platform professional operation and e-commerce, perfected Chongqing’s multinational e-commerce system and promoted its development. I assume "perfected" should be "perfecting". 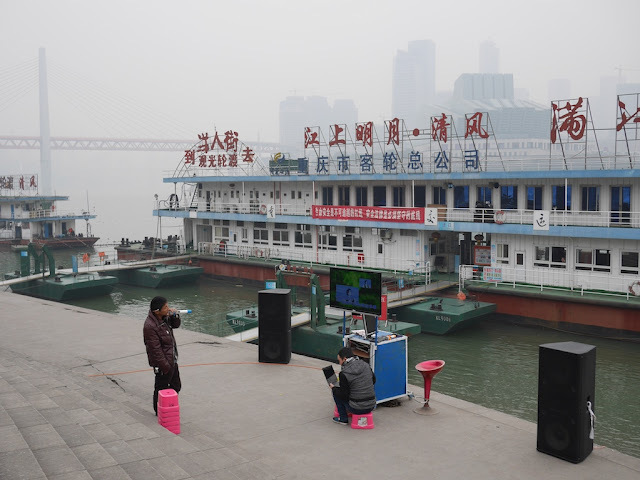 If they have indeed "perfected Chongqing’s multinational e-commerce system", I need to go back. 70 years ago today, International Holocaust Remembrance Day, Soviet troops liberated Auschwitz-Birkenau, the most deadly Nazi concentration camp. Children of survivors, we don't have any artifacts. We don't have photographs. We don't have family heirlooms. They call us the second generation, which, if you think about it, it means our parents are the first generation and nothing existed before us. And it's not true. We had a whole history. We had a whole world. And my grandfather is just one person in that world, but he existed before the war. 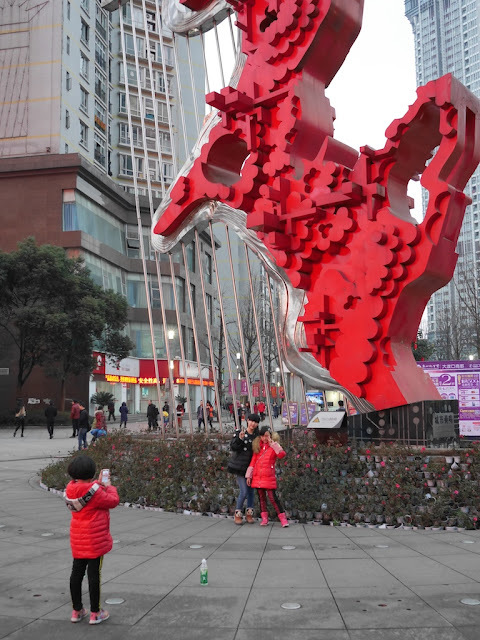 Just over a week ago at the Jiefangbei pedestrian shopping area in Chongqing's Yuzhong district, you could see something was curiously hidden. 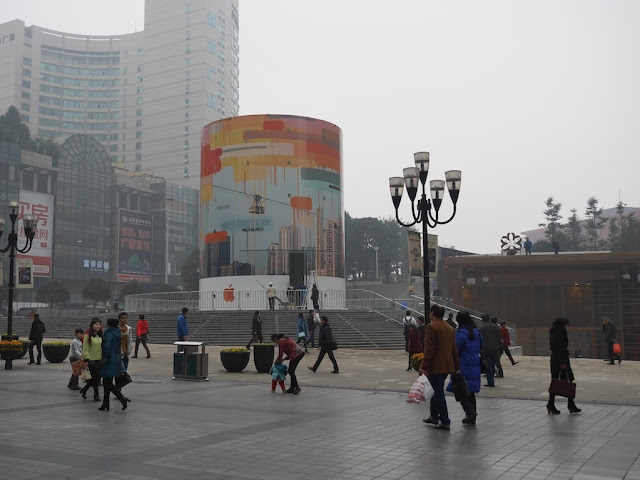 The cylindrical entrance for the new Apple Store which will open January 31 is now covered with a copy of a mural — the result of a collaboration by photographer Navid Baraty and artist YangYang Pan (潘阳阳). Apple posted a video about the artistic process on its Chinese retail website (HT MacRumors) and someone Apple has posted it on YouTube as well [link updated]. 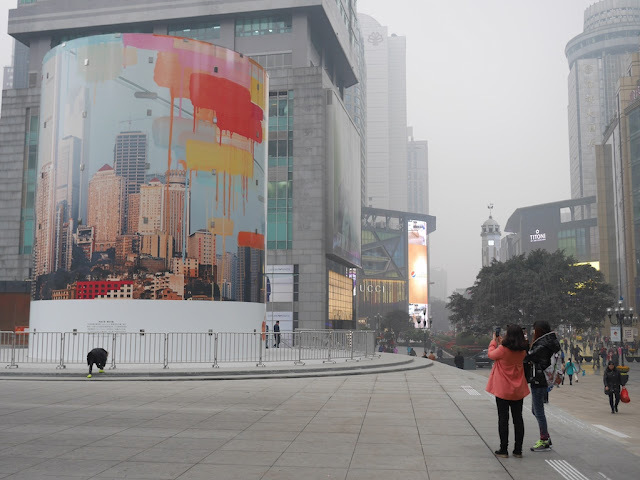 During the brief time I was there, the mural received a bit of attention from passersby. 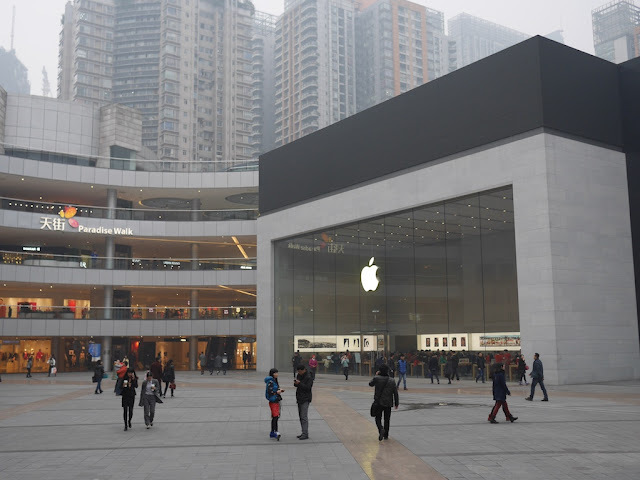 For those in Chongqing who can't until Saturday to visit an Apple Store, there is already an option at the North City Paradise Walk shopping mall in Jiangbei district. The store seemed to have a decent crowd yesterday for a Monday afternoon. 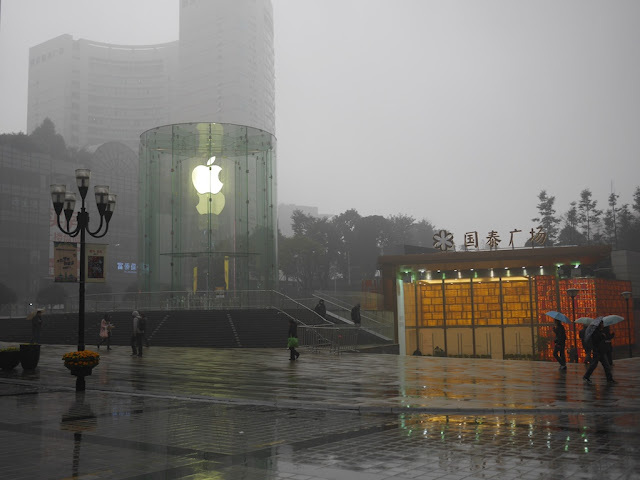 For those who can wait longer than Saturday, soon Chongqing will have the same number of Apple Stores as Hong Kong. 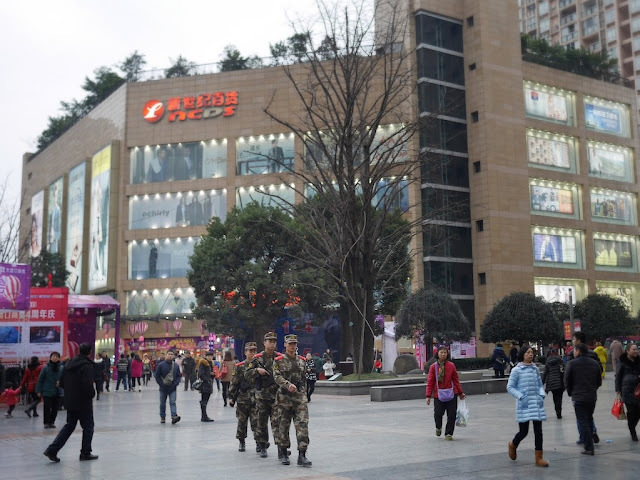 A third store is under construction at the MixC shopping mall in Chongqing's Jiulongpo district. 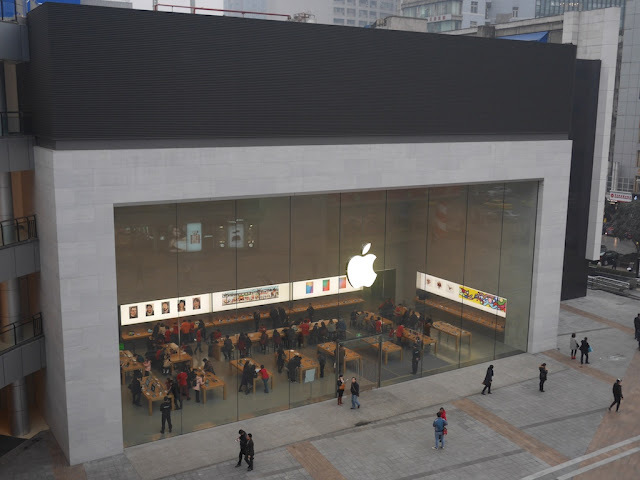 Only Beijing and Shanghai currently have more Apple Stores in China with four each. 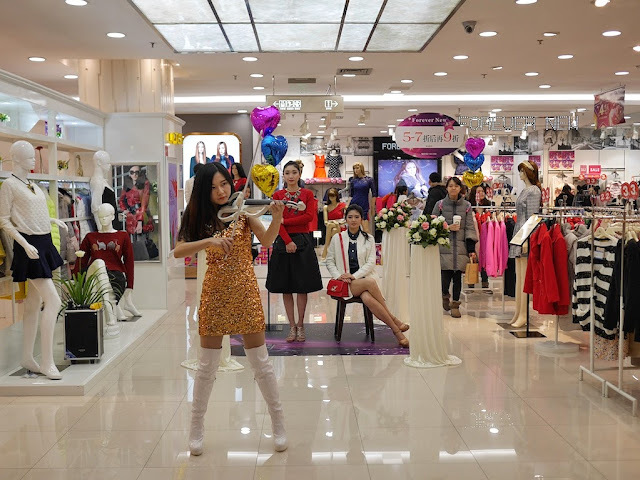 Single stores can be found in other cities in China — Chengdu, Hangzhou, Shenzhen, Wuxi, and Zhengzhou. 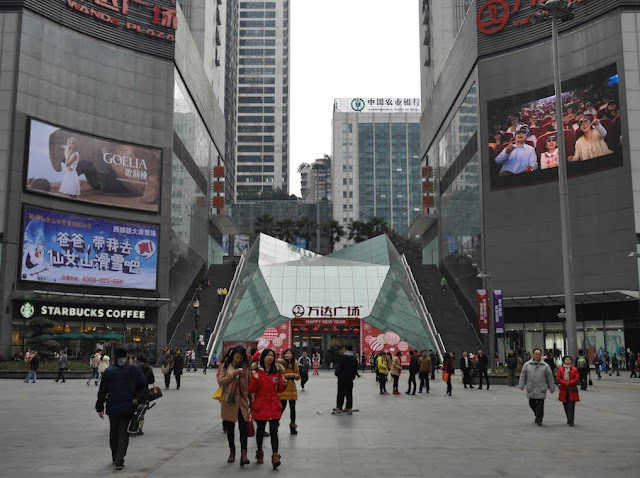 The stores in Chongqing are indicative both of Apple's focus in China and the city's own impressive growth. 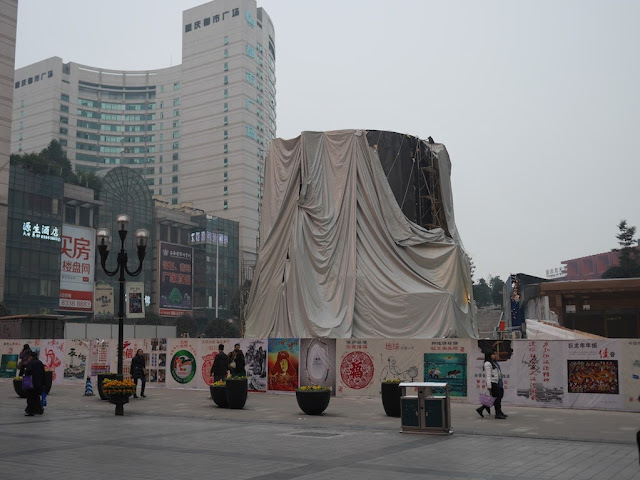 UPDATE: No need to rush to the Jiefangbei Apple Store if you want to see an art-covered cylinder. I walked by again this afternoon, and the outside art is now gone. Perhaps the lit up Apple logo works better under today's darker skies & wetter weather, and the original artwork will be on display inside when the store opens. And it was time to dance . 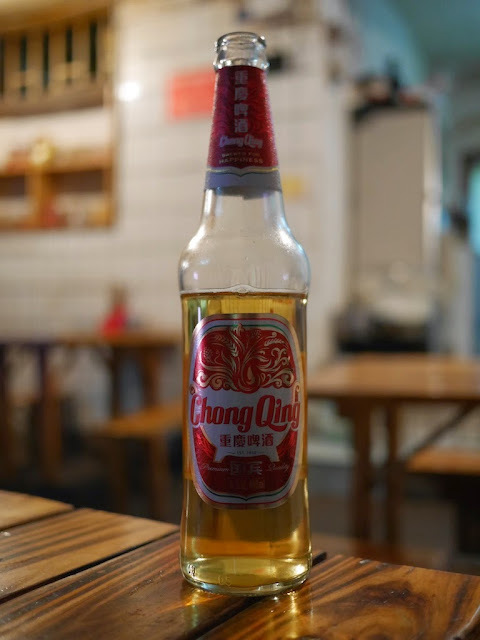 . .
One night at a slightly upscale restaurant in Chongqing, I ordered the Chongqing Brewery Company's Shancheng Beer 1958 (9.5°), partly because I didn't recall trying it before. 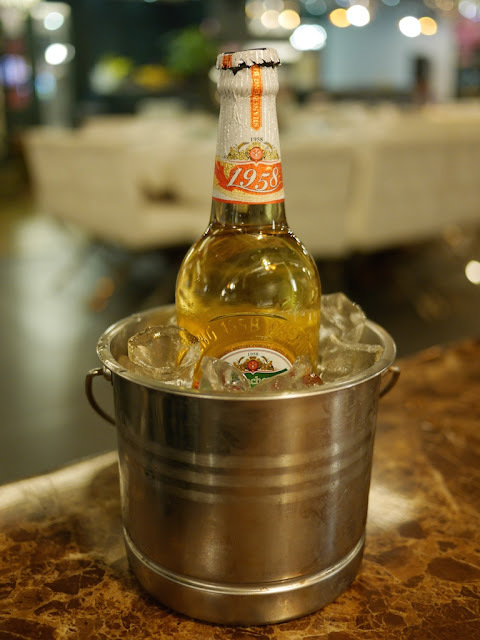 Many people in China are content to drink beer at room temperature (whatever that may be), so I made sure to ask for a cold bottle. They didn't have one, and I said a regular bottle was just fine. The restaurant's effort was most appreciated. I don't think a beer that one reviewer described as having the taste of "grainy malts, plastic, cardboard, grassy hops and some light citrusy notes" could ever look better. 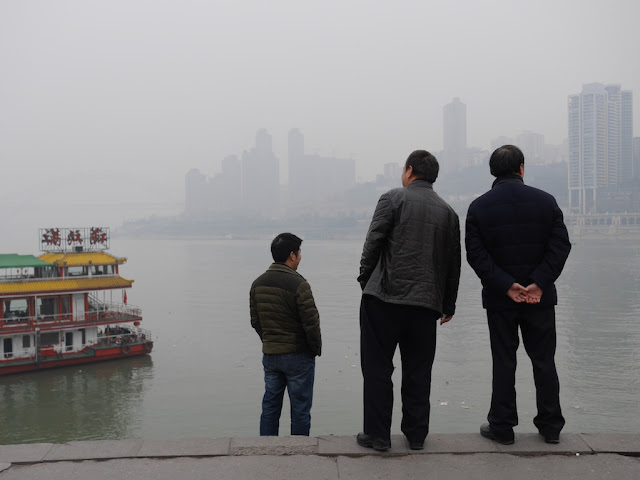 Chaotianmen is at the northeastern tip of Chongqing's Yuzhong district where the Jialing River merges with the Yangtze River. 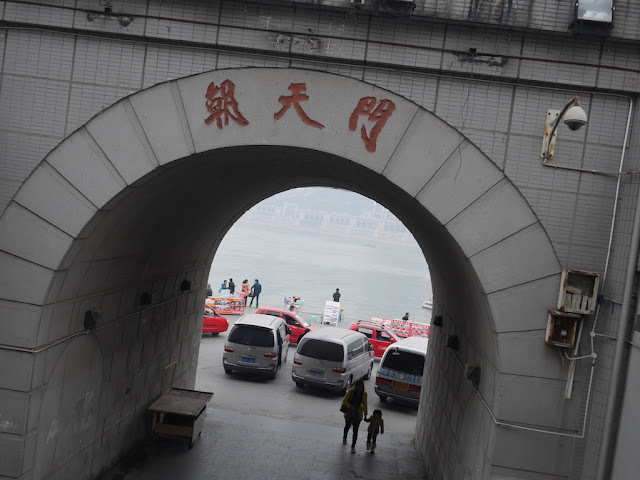 With views of the city which have changed significantly in recent years, it is an especially popular destination for tourists, including those who board boats for cruises. Below are photos which capture some of the people there and what they were doing, in addition to the outdoor karaoke I mentioned before, one afternoon. I share these in part because Chaotianmen itself will undergo significant change — a topic for a later post. 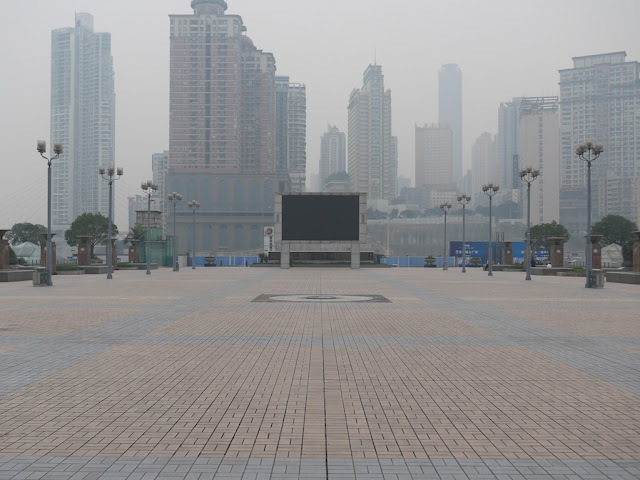 Chaotiamen Square was not exactly full of people. 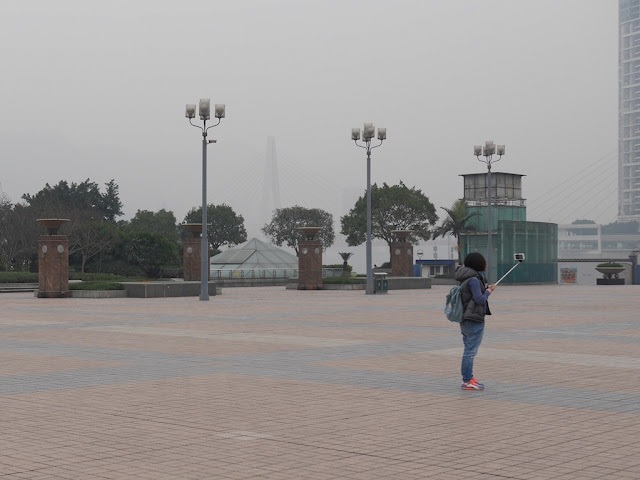 But people photographing others could be seen. Taking in the view was a popular choice. Some were more occupied with their phones. Looking down at the tip of Chaotianmen one could see more activity around the steps down to the docks. 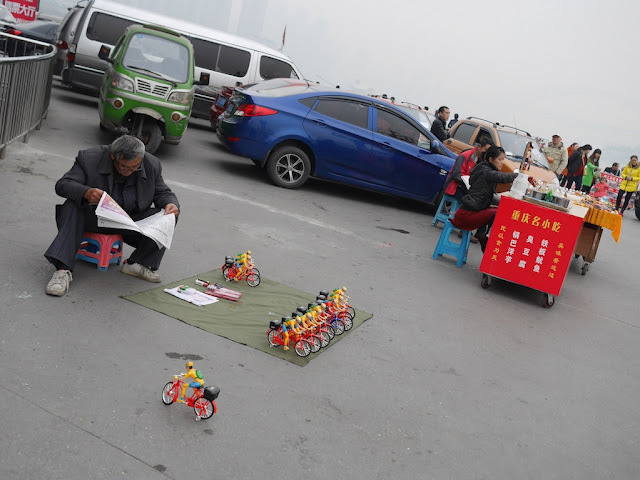 Vendors sold a variety of items. 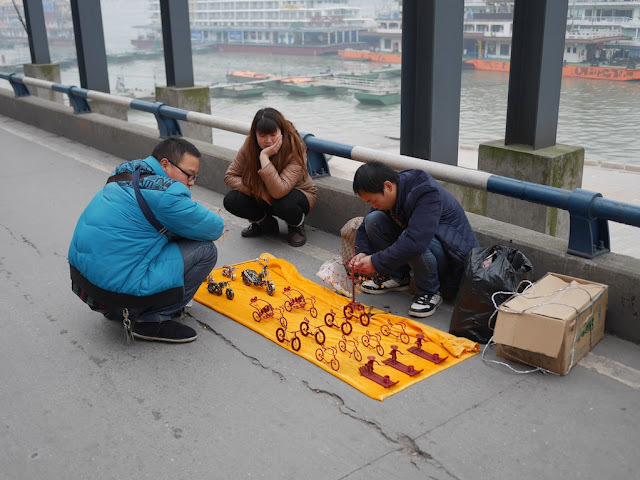 Bikes made out of wire was one option. Electric bikes were another option. Bargaining skills could be useful. 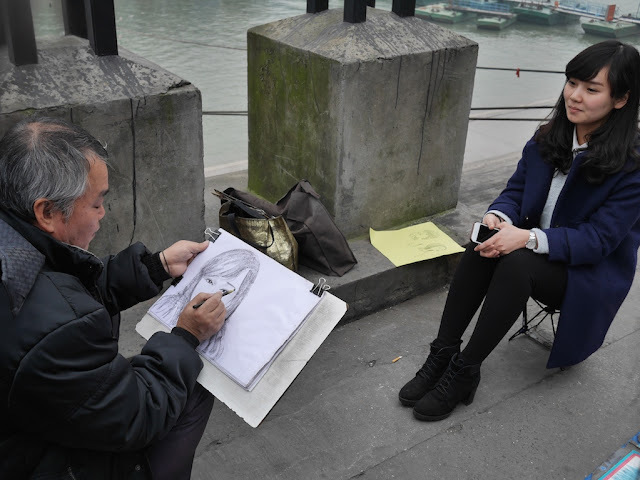 Or you could have your portrait drawn. 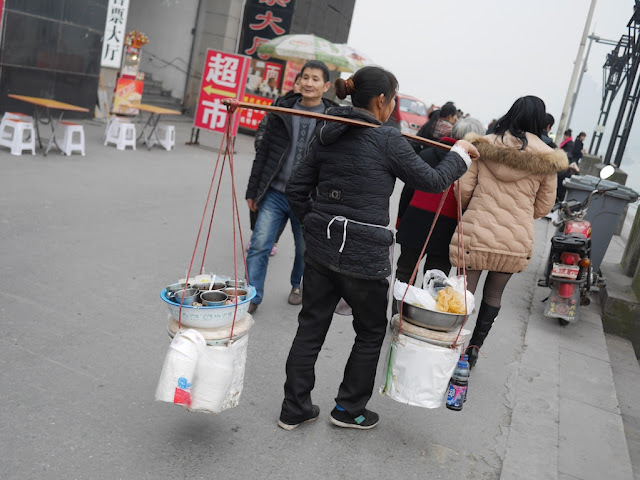 Mobile vendors were one source of food. Other options for outdoor dining could be found as well. Like the square, some people took in the view. And others were more focused on their mobile phone. Few seemed interested in these no-longer-in-use inclined lifts at the docks. 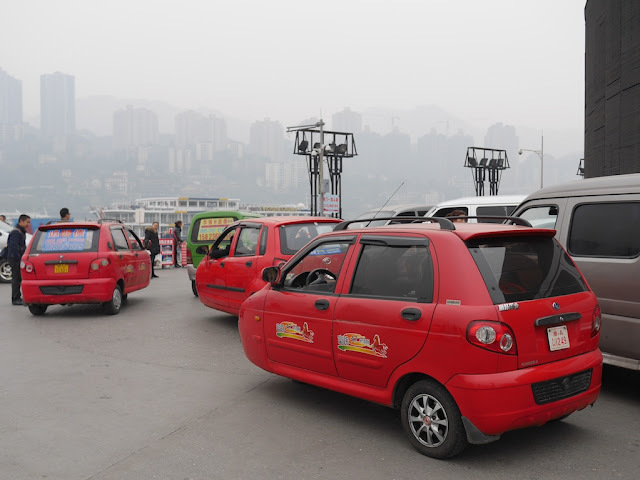 Three-wheeled taxi cars were one way to depart. 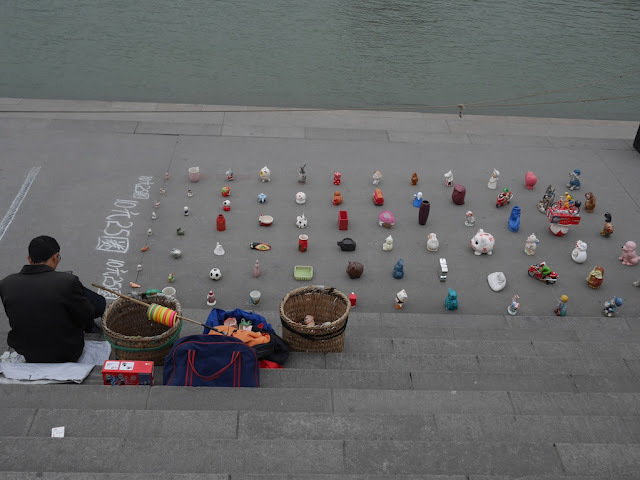 Most left by foot on a road along the Yangtze River. 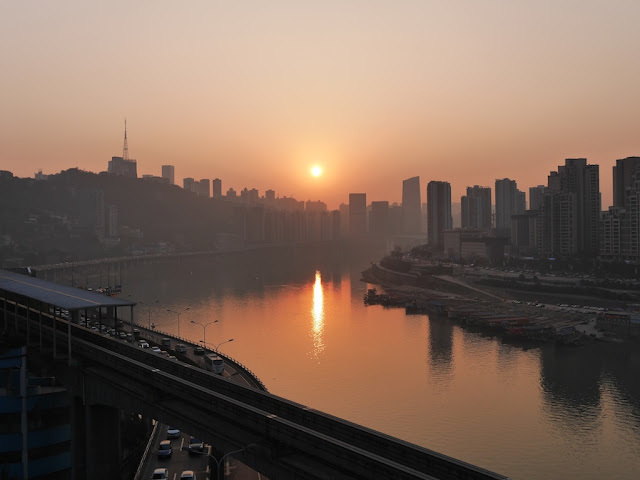 Yesterday, I shared a photo taken at sunrise of two buildings in Chongqing. For some imperfect balance, here is a photo taken 16 minutes after sunset on the same day. 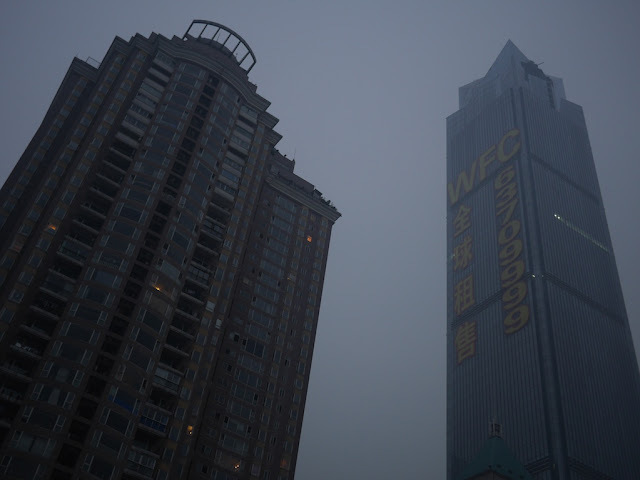 The Chongqing World Financial Center (WFC) is easily identifiable in the previous photo. 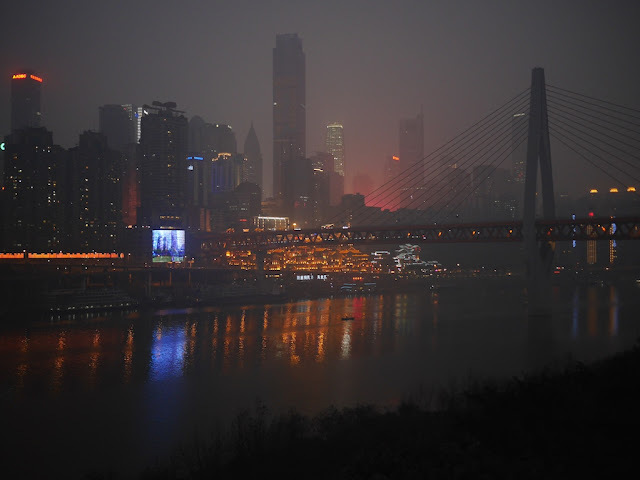 Chongqing's tallest skyscraper also appears, near the center, in the above photo. 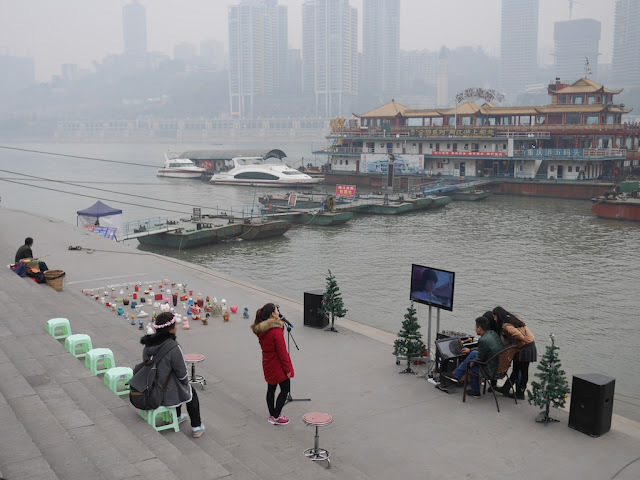 More buildings in Chongqing's Yuzhong district, the Huanhuayuan Bridge with two trains on it, a giant video screen, and the Jialing River can also be seen. Based on the view, I thought air pollution conditions had significantly improved from the morning, but online figures indicated otherwise. 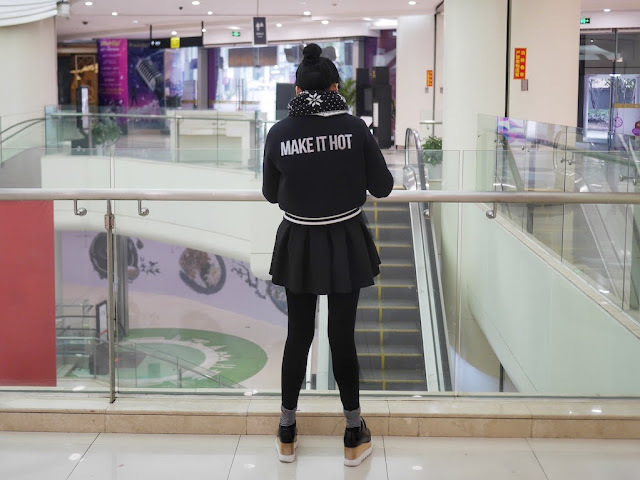 Perhaps I shouldn't have left the previous post, which was about a coat's timely message and Chongqing's temperatures, somewhat hanging with a comment about bad air pollution. 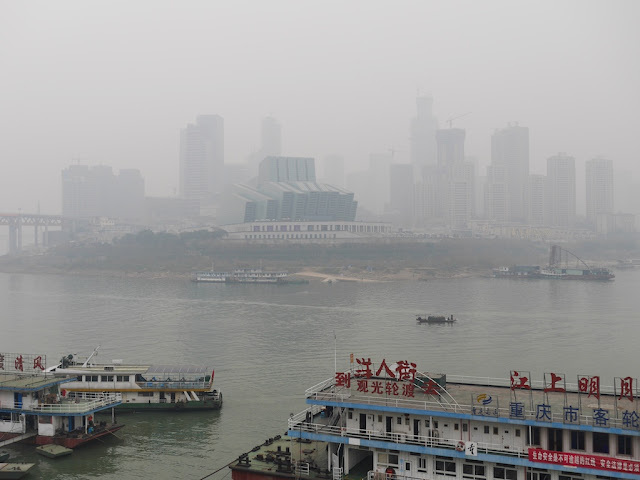 The buildings barely visible in the distance are located across the Yangtze River. 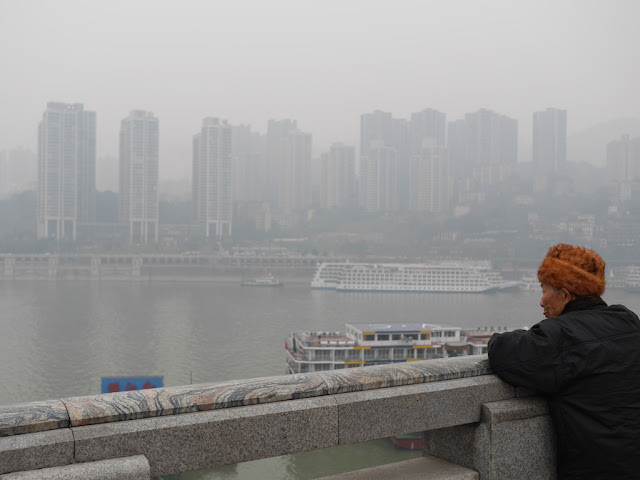 I can't say to what degree fog may have played a role in the haze, but, even though Chongqing's air quality improved over previous days, it was definitely bad today. Maybe someday soon I will see a "Make it Fresh" coat. 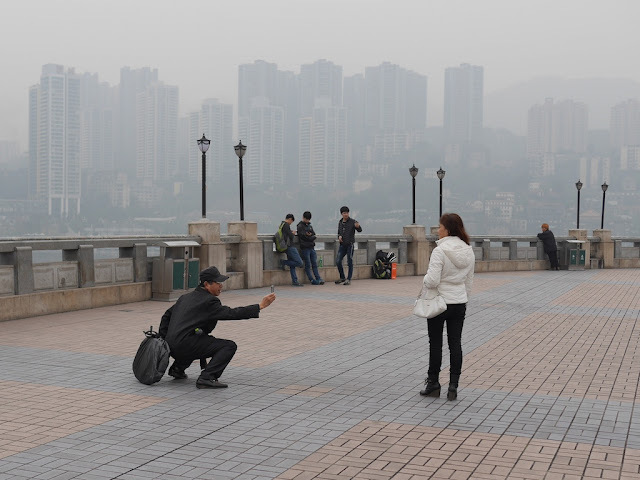 Indeed, Chongqing was a bit chilly today . . .
On another note related to the phrase on the jacket I saw today, this evening I ate at a comfortably toasty restaurant. The temperature was quite a change of pace from the many other colder places I've eaten at recently. 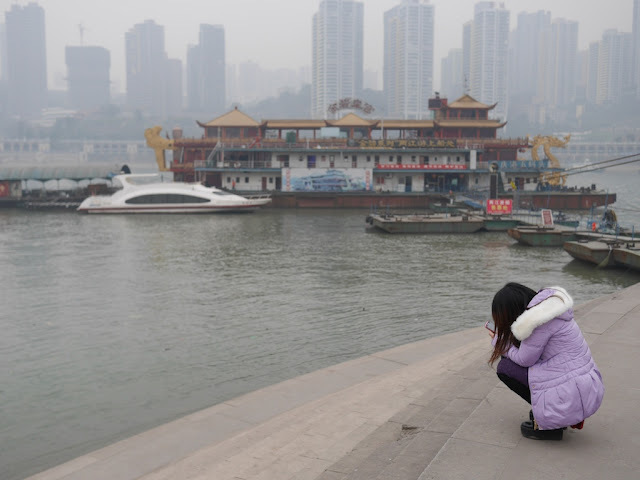 I could now write a long post about the common lack of (or use of) heat in more southern regions in China, but I will save that for another day. 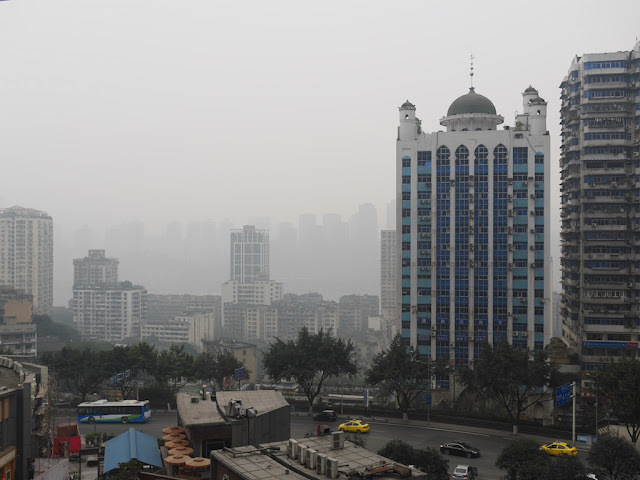 On the whole, I am not complaining about the weather here, especially since Chongqing is known as one of China's "three furnaces" for its sweltering summer heat, as I enjoy walking around in cool temperatures. 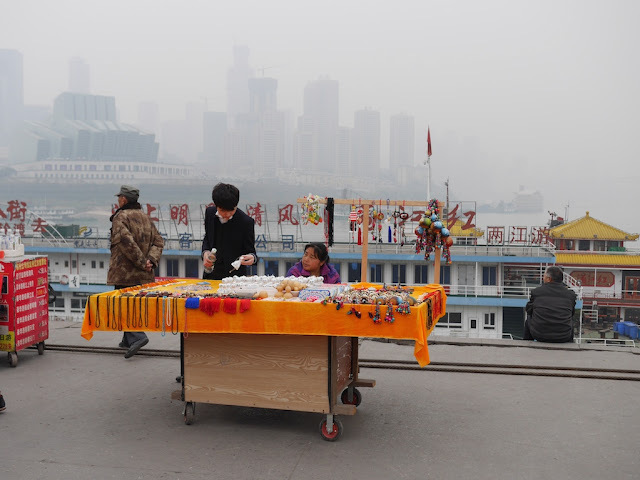 Unfortunately, air pollution has negated some of their pleasant effects. 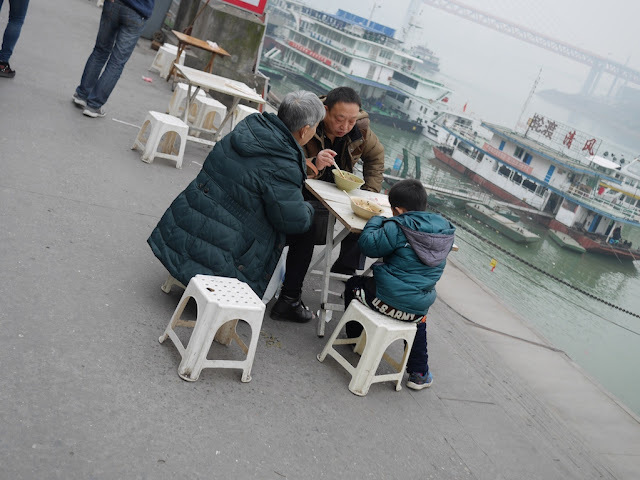 A scene I saw today captures some key aspects of what has and has not changed in Chongqing, China, between my first visit here in 2009 and my return six years later. 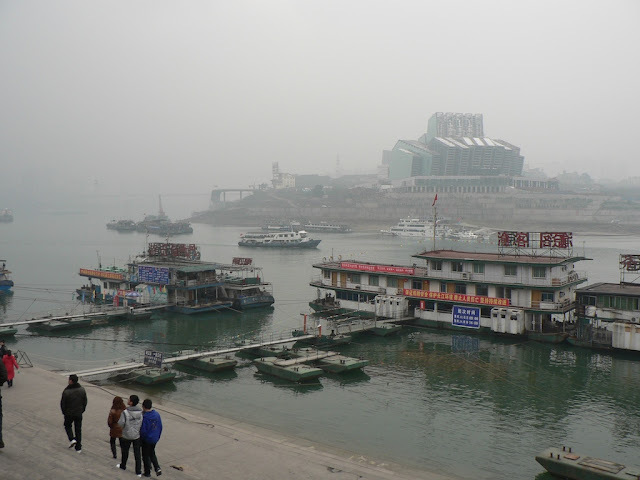 In January, 2009, when I visited the docks at Chaotianmen I took a photo of the nearly-completed Chongqing Grand Theatre across the Jialing River. 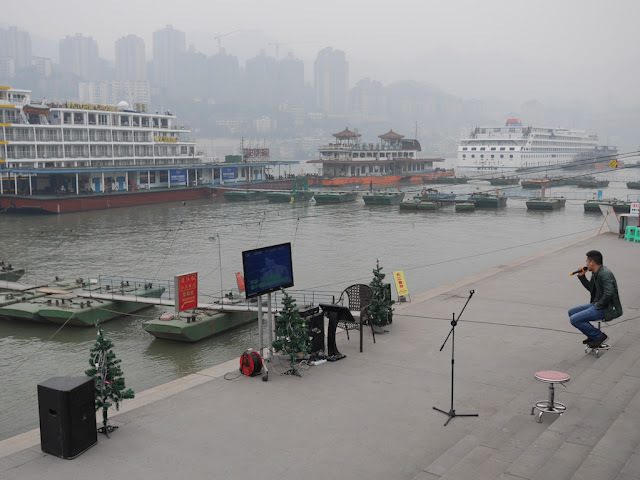 Today I took a photo of the now open Chongqing Grand Theatre from a similar location. 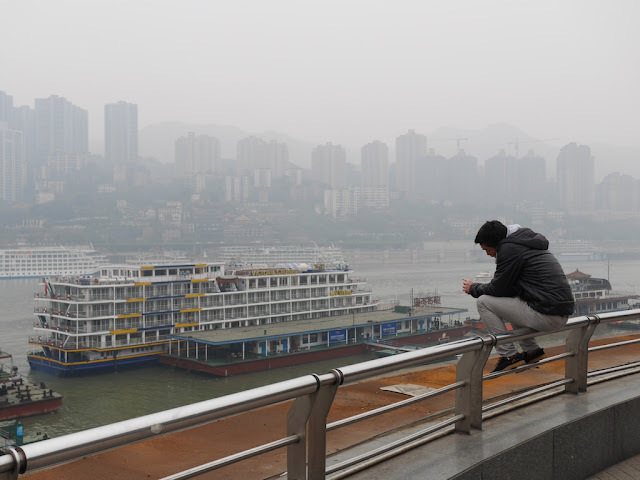 The photos show how Chongqing's reputation for its fog and smog, both likely playing a role today based on weather and pollution reports, has been long standing and well deserved. They also both show some of the many boats popular with tourists. But the differences between the two photos are even more striking to me. 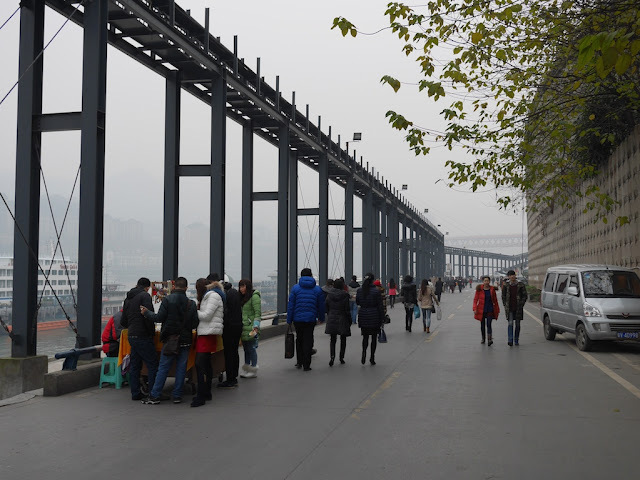 Not only are numerous new tall buildings readily apparent in the 2015 photo, but a portion of a new double-decker bridge crossing the Jialing River with levels for cars and trains can be seen as well. 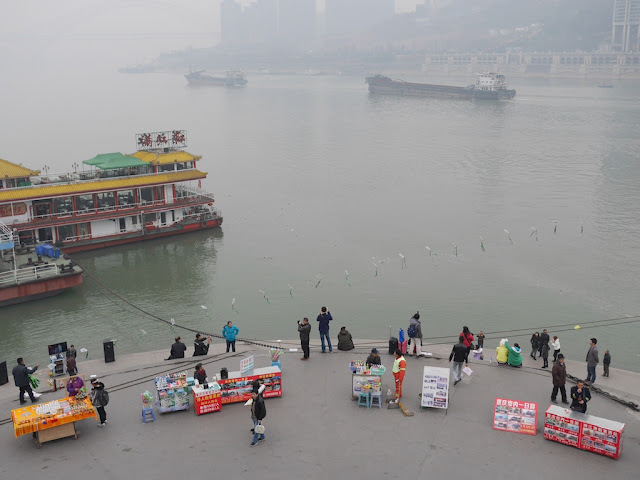 And if you look closely at an enlarged version of the 2009 photo (click it), you may be able to spot the cable car, now no longer in existence, crossing the river. 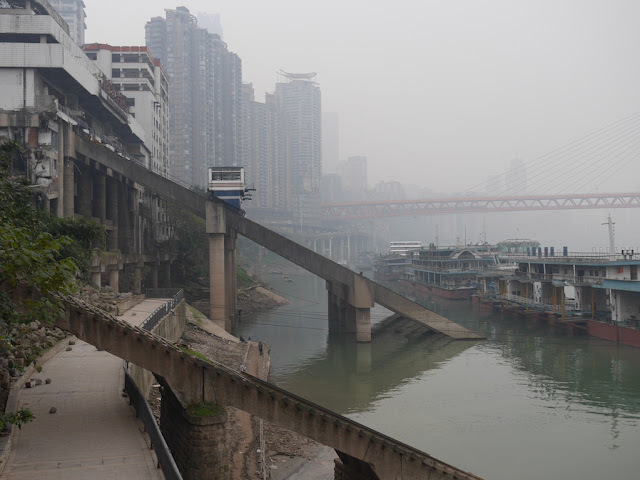 Most incredible, what is captured in these photos represents only a small portion of the change I have noticed in Chongqing. More to come on this theme. 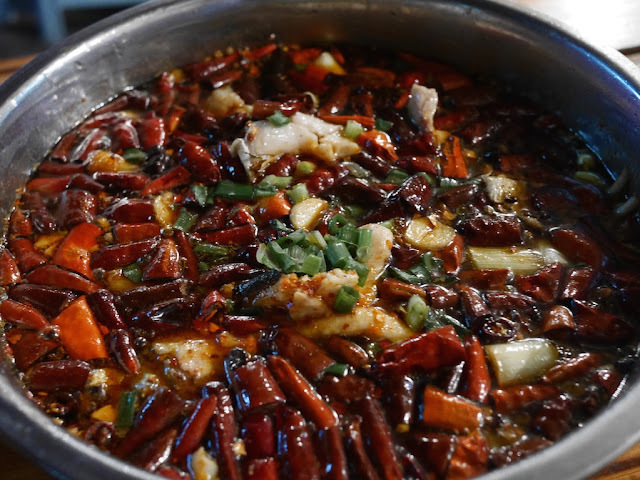 Similar to the recent dinner I had on an overnight train, the meal I consumed on a plane today will not enter my top ten list of meals I have enjoyed in China. The flight attendant told me the meat was chicken, but it didn't seem like a poultry substance. I am not sure what it was, but it reminded me of yak meat. The wet wipes had a nice smell and were made in Xinjiang. I feel fortunate that my nearly three hour flight did not feature anything similar to one of the "flying China-style" problems which seem to often make the news these days. In other words, the flight was not delayed, no flight attendants were violently attacked, and no passengers attempted to open the emergency exit door for fresh air. Way to go, team. The end of the flight did feature something I commonly experience when flying in China and which does not thrill me. 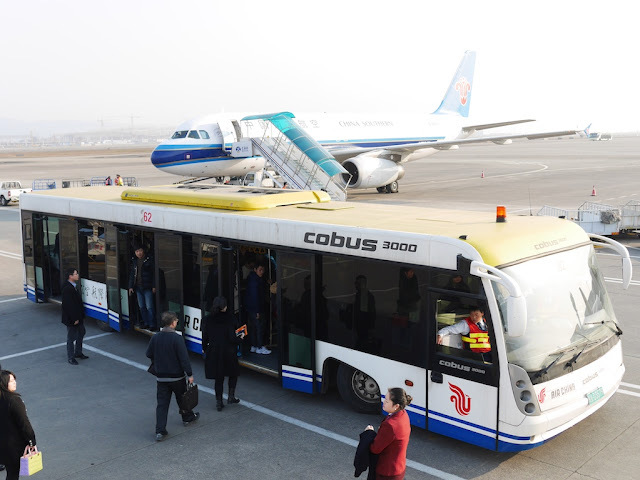 Despite numerous open gates at the airport, the plane did not park at any of them, and instead we had to take a bus from the plane to the airport terminal. 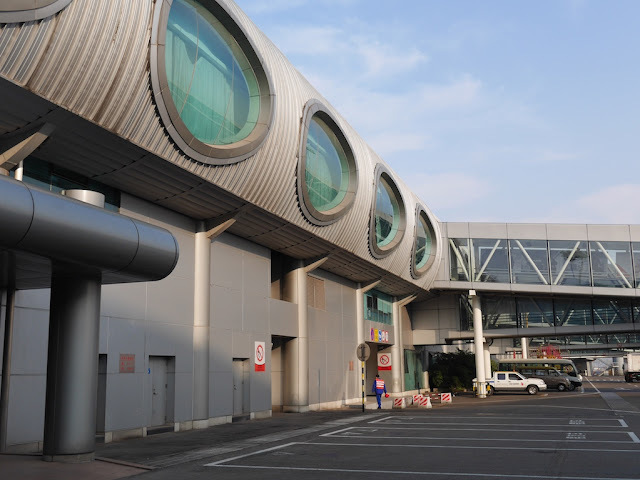 Once off the jam-packed bus, I considered the architectural style of the airport concourse. After that, I was excited to be back in a city I hadn't set foot in for almost exactly 6 years. 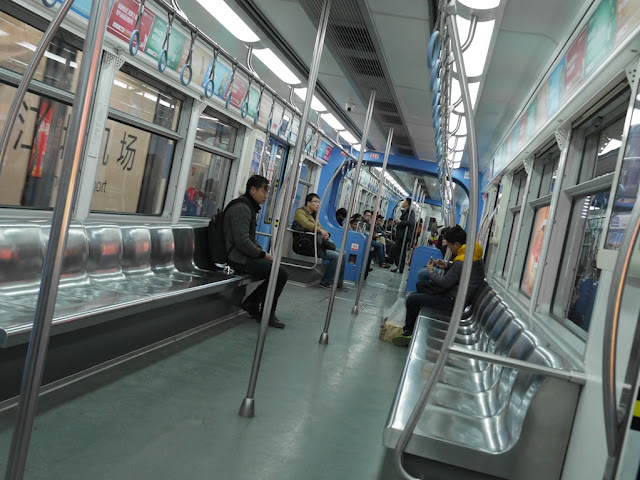 Rail was not an option for traveling from the airport before, but it was now. Since the monorail train, which soon filled, traveled above ground most of the time during my hour-plus trip, there was ample opportunity to look around at the city and marvel at its size. I paused to soak in one scene when I was switching train lines. 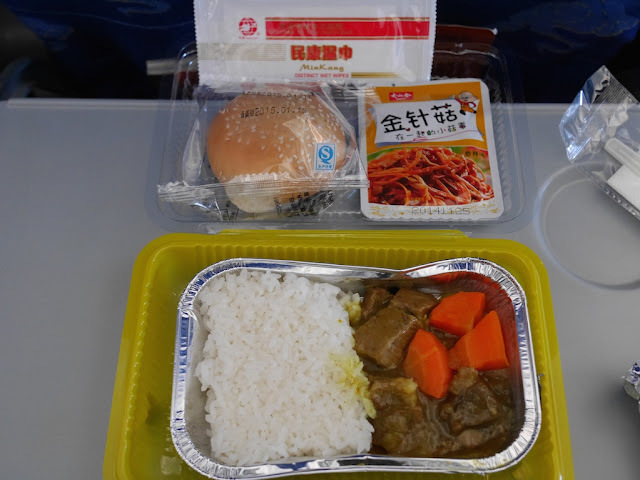 Not long after that, I was able to put the plane's mystery meat behind me by diving into some appropriately numbing and spicy local food. Some savvy readers may have figured out my current location in China, which is far from Shanghai, Hong Kong, and Beijing. For others, I will provide one last clue: the beer which accompanied my outdoor dinner. More soon about a fascinating hilly city where I have already noticed a tremendous amount of change since my last visit.